eBay sent a marketing email on Friday with a 20% coupon for shoppers, but it was only good when purchasing items from a single seller who solicits consignments on her eBay Store. It's not uncommon for eBay to single out a small group of sellers who participate on its Deals site, but it's extremely rare for eBay to give such visibility to a single, non-Deals seller. The subject line of Friday's email read, "Hot coupon savings! Take 20% off pre-owned luxe goods." 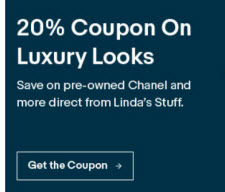 Inside, there was a graphic: "20% Coupon On Luxury Looks - Save on pre-owned Chanel and more direct from Linda's Stuff," and a link titled "Get the Coupon." eBay was also running a link to the coupon in a banner on the homepage slider for a time. "How to redeem your Coupon: Shop for eligible items from specific sellers as listed above. Enter the Coupon code in the redemption code field: JUSTSAVE20 Pay for your item by 11:59 PM PT on February 5, 2019. Additional Coupon Terms & Conditions: Limit one use per transaction (or cart) while supplies last. Max three redemptions per user. Coupon is subject to U.S laws, void where prohibited, not redeemable for cash, has no face value, and cannot be combined with any other Coupon, or when paying with PayPal Credit Easy Payments or Gift Cards. eBay may cancel, amend, or revoke the Coupon at any time." Interestingly eBay allows the seller to solicit consignments on her eBay Store homepage, linking to a page that prominently features her telephone number. As far as we know, eBay still bans sellers from displaying contact information on eBay, per the 2017 Seller Update. It's also worth pointing out that eBay's practices around consignment selling are controversial ever since it pulled its support of Trading Assistants, and we imagine this promotion may sting for many sellers. That's clearly hypocritical of them, and shows, without a reasonable doubt, that they do NOT treat every seller the same. Everytime Greedbag sends us one of these so called coupons with buy from only sellers WE PUT EACH SELLER ON A DO NOT BUY FROM LIST. Our family who spends thousands of dollars will not cater to the sellers who really think they are better than someone else. Thus will NEVER purchase so much as a stamp from any of them. That is absolutely hilarious. Just go and take a look at her feedback ratings. I purchased three cashmere sweaters from that twerp and two came in covered in moth holes. Hahaha. Well done Ebay! That particular seller needs a coupon to hire help to police her merch. A lot of it is too damaged to use, dirty or damaged or just plain overpriced to be used. So much the her reputation. Once, I bought a pair of shoes from her that were slightly worn--in the photo at least. When I GOT them, the soles had a crack in the leather and were well stained. In fact, they were filthy. At the time, eBay was still allowing a non return policy or I would have sent them back. I got the impression her staff probably "borrowed" them and put them back. The only good deal I got from her was a NWT dress which was shown intact but upon arrival, was missing half of the unique buttons. Nowhere in the auction was this l'il factoid mentioned. The dress was beautiful but it was harder to to get buttons that matched as well or were the right size. Took me a month to find some. It's a good thing I can sew. Coupon? No thanks, when I want rags there's a Goodwill right up the street. eBay = straight pay for play. As others said - and Ive echoed it myself many times - eBay isnt about ecommerce - its about using ecommerce as an advertising platform. When/if you care about actually selling things (amazon, walmart, newegg etc) you can and do make sales. When you dont ... its just a way to get eyeballs (so to speak). People "here" seem to be "shocked" that eBay would do this game ... Im not - eBay has NO FLOOR, and will do ANYTHING for money - legal or not. As long as the jet planes are flying and the big bonus's keep coming - thats all that counts. Linda's Stuff has been a black eye on fashion sales for years. She is known to sell fakes and her descriptions have often not matched the product. I started reading some of Linda's feedback, and it seems that most of the negatives and neutrals are for defects not disclosed in the listings. And I thought it was funny that a lot of people who bought shoes from her state that the shoes are different sizes for each foot. Typical great seller on Greedbay. They get away with it because they bring in the dollars and ignorant buyers keep buying. Greedbay makes money. They could care less. Why would they showcase a seller who is a part time hobbyist who sells maybe 20 items a month. They take up space. They hardly make Greedbay money. They are the noise that squeaks in the background when you step on what they think is their right. Linda's Stuff was once one of the biggest fashion sellers on the eBay site and e-commerce when it comes to consignment. They are getting hammered by the Real Real. People have left Linda's stuff for a variety of reasons, but mainly horrible Sell Through Times and the continuing plummet of sale prices. The payouts are getting less and less to her consignees. Meanwhile for eBay, they see another site, The Real Real, that was created truthfully by the help of eBay and their mismanagement. The Real Real is getting a ton of press right now and a ton of customers. Over 1 billion in sales the past year. They did the same thing with REVERB. Reverb is killing eBay in the Musical Instruments category. So Ebay followed suit and dropped their final value fees to match Reverb at 3.5%. It was too late. Reverb is a much better site and does not allow commodity items to flood their search. eBay just keeps breeding their competition and then trying reactionary promotions to correct years of mismanagement that allowed these sites in the first place. Linda's Stuff is really feeling the pinch financially. They are a big operation that will most likely not make it. They should spend their time trying to join forces with the Real Real and leave eBay behind. Save on top brands from our hand-picked trusted "
now of course it could/will change ..... as soon as they are caught (or not) but why not show ALL listings that are similar? This is nothing new with eBay. I remember years ago they had a contest with three winners - small, medium and large store owners. With the prize things to help them boost their business. The deal was how well your store was set up, your feedback and other things I can't remember now. So I was a chump and entered the contest. I thought I had a pretty good set up store. So they announce the winners a few weeks later. The small store seller winner, I just about dropped my jaw to the floor. Had about 20 items, lousy listings, and even with so few items, their categories were a mess. Absolutely nothing special about the seller or their store or anything else. I felt like a chump. If his store was what eBay considered a great store then I was definitely in the wrong place as my store was too good for eBay! This I have found over the years is how eBay always works. There is no rhyme or reason for how they select sellers for these honors no matter what kind. I got brave last week and bought a few things on eBay from I think four sellers. So far only one package had a packing slip. As everything I bought was about the same sort, I had to do a lot of shuffling to see who's stuff and got. Is it that hard to enclose a packing slip? Sorry, not on topic, but just more of the sadness that has become eBay. For a link that goes nowhere useful check the top left info boxes in the shop listings. This item’s authenticity has been verified. Guaranteed by eBay. Learn more"
Either eBay is now verifying the authenticity of luxury goods or the shop owner is just plain lying. In my experience buyers do not want packing slips included with their packages. It goes both ways. I have had many people ask prior to shipping not to include a package slip, but not one person in 20+ years ask for it to be included. I use Linda's Stuff as my consignor. I'm sure she got a nice agreement with Ebay for that discount & promotion. I believe she just transitioned to Ebay because she has her own website. "That is absolutely hilarious. Just go and take a look at her feedback ratings. I purchased three cashmere sweaters from that twerp and two came in covered in moth holes. Hahaha. Well done Ebay!" I send luxury goods (YSL) to the Realreal first. If they reject it then I send it to Linda's stuff. EB would do well to look at sites like Posh, where it is SOOOO easy to list one or more items. You can also setup a "boutique" in Posh = store on Ebay. With my store I'm paying 4.95 a month + fees which equal about 18% of the items (add .03% for PP). That equals the same as Posh @ 20%. Ebay should streamline and stop adding on all this nonsense feature. I have friends who own a B&M Store & also sell Consignment of fine jewelry & designer goods on eBay; honest, decent, hard working people. I was looking over their listings one night. in case buyers had more questions regarding the items or pickup options. O.M.G. ! I panicked and called the lady, after midnight. Got her out of bed. Hurry, I said, go to your eBay & bulk edit the phone number OUT. It is a violation to have that contact info. anywhere. If someone reports you, they'll shut you down. She got up, and, took care of it. I was dismayed to read that the Seller mentioned here is allowed to link to a phone number. That is simply not fair. I hope my friends don't see this. They'll think I don't know what I'm talking about. @iAuctionExpress - I agree about packing slips. I have never sent one to a buyer, even when they've purchased multiple items. Back when I was still selling on eBay I had a buyer ask for a packing slip (for one item), and I told her that her PayPal receipt and her eBay order was all she needed. Personally, I throw out packing slips I receive from eBay sellers, and assume most people do as well. I've been buying from Linda's Stuff for years. I'm usually very happy with the value and quality of my purchases. If there is ever a problem with an item, Linda's accepts returns with no problem. They are one of the few eBay sellers I can shop with complete confidence. It's not fair for everyone to jump on them for running a sale. It's not an easy business and they certainly do things right.